After spending a few years in the political wilderness and having failed to adjust himself in the Akali culture captain Amrinder Singh has joined Congress, accepting the stewardship of Mrs. Rajinder Kaur Bhatthal. Amrinder had left this very Congress in 1984 in the wake of operation Blue star and was highly upset of the Party. During his long honey moon with Akalis he made desperate attempts to be on the centre stage of the Akali politics and once went to the extent of signing the controversial Amritsar declaration which had some secessionist overtones following which Akali Dal Amritsar was formed dissolving the Dals of Mann, Tohra, Barnala- Amrlnder. These leaders then had to perform the 'seva' by dusting the shoes at various Gurudwaras. Amrinder then tried to perform the sewa but began to vomit and then abandoned as the Prince could not digest the dust of the sangat shoes'. During his pc.grdl press statement he has hinted at his future aims and objectives and would wish to seek some central berth for him leaving the state politics to Mrs. Bhatthal. May be the local politics are too tough for him and he has preferred comparatively easier roles of like the ones performed by late Mr. Baldev Singh, Swarn Singh, G.S.Dhillon, and Buta Singh. May be the recent example of Mr.B.S.Ramuwailia, Union Welfare Minister prompted Mr. Amrinder to go the Ramuwalia way, i.e he need not have a big cadre base. Also Mr. Buta Singh is under the scandalous shadow of Hawala and Jharkhand MPs bribery case. The Captain may thus be thinking that for him the passage is clear. Amrinder has surely and rightly calculated that a vacancy of the sorts existed in the Congress campus of Delhi. But he seems to be some what over-optimistic as to the possibilities of Congress's returning to power. As Amrinder does not subscribe to any 'ideology it would have been better for him if he had preferred BJP to Congress. It is also a fact that the Captain has been forced to go the way he went. For a long time he has been sending feelers to Badal for his adjustment in the Akali Dal or the government set up. G.S.Tohra, the master maneuver had opposed his entry into the Badal Akali Dal. So Much so even Farooq Abdula; CM Jammu and Kashmir also recommended his case to Badal. Mr. Badal due to political compulsions could not ignore Tohra's opposition to Amrinder. Mrs Bhatthal gave no further chances to speculate and lifted the Captain to Congress. Any way as an obedient Captain (not a lieutenant) Amrinder has fired his first salvo making Tohra his target. There was lot of scope for Amrinder here too. But he failed. While the credentials of Tohra are well known Amrinder charged him with an allegation that Tohra was an lSl agent. Keeping in view the trends in the Sikh psyche Amrinder inadvertently boosted the image of Tohra in the Sikh circles. 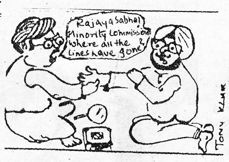 While Tohra was amused at the charges of Amrinder, it was Badal who rushed to the 'rescue' of Tohra and explained that Tohra was a nationalist minded leader. The way Badal issued 'nationalism' certificate to Tohra one wondered why not Badal issue such certificates to his entire flock. It is also surprising why Amrinder has ignored S.S Mann in their brawl on nationalism and antinationalism. May be the family connection is more important than the national'.